"A good rider can hear his horse speak to him, a great rider can hear his horse whisper, but a bad rider won't hear his horse even if it screams at him." What is a 'Back Man'? Can anybody call themselves an Equine Osteopath? Can anybody call themselves an Osteopath (treating humans)? Do I need my vets permission? Will treatment hurt my horse? Will my horse be sore the next day? Will my horse need any time off after treatment? 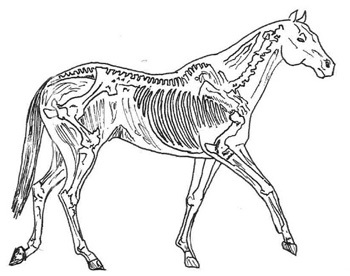 Equine osteopaths use their hands to identify and treat abnormalities within the equine structure and function. A variety of stretches, mobilizing and manipulative techniques are used to improve blood flow and soft tissue drainage, release tension and improve joint mobility. A 'back man' may be an osteopath, it is important to establish which area your 'back man' trained in and also to check that they are fully insured. Osteopaths are all fully trained osteopaths (for humans) who have also completed a post graduate diploma in animal osteopathy. Yes, anybody can call themselves an equine osteopath even when they have had no training, no background in healthcare or even worked with animals! It is important to check the qualifications and insurance of any practitioner working on your horse. No, you have to hold a recognised qualification (currently an honours degree in osteopathy) and appropriate insurance. Osteopaths are lobbying to have the term 'equine osteopath' protected by law as we believe the general public is being misled and horses' welfare could be at risk. Yes, we are fully insured. Please advise at time of booking if your horse is worth more than £100,000. Will my pet insurance cover the cost of treatment? Many horse and pet insurance policies cover treatment by osteopaths. Please check with your insurance provider before booking an appointment. At the first treatment your equine osteopath will assess your horse whilst being walked up and then trotted up. Once back in the stable the horse will then be assessed for flexibility, mobility, points of tension etc. The osteopath will explain simply and clearly all the issues that are found and also explain the treatment planned for your horse. Your verbal consent is gained before any treatment takes place. Yes, diagnosis and treatment of all animals is controlled by veterinary surgeons (Members of the Royal College of Veterinary Surgeons). No, whilst equine osteopaths some times have to use strong movements to affect change, the techniques used will not cause pain to your horse. Obviously if a horse is very sore before the treatment, they will try to resist certain positions but most horses enjoy the treatment and sometimes even go to sleep! Depending on the condition/injury your horse had it is likely that your horse will still be feeling sore for a day or two after treatment. It takes a couple of days for everything to settle down. If your horse was not sore before the treatment they will just feel like they have had a good work out and may feel a little fatigued. It is best to turn your horse out for a couple of days or just lightly hack if possible. 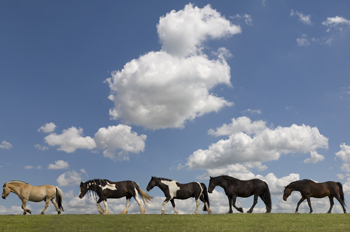 Your equine osteopath will advise you on care of your horse following treatment. It depends on how severe your horse's condition/injury was before the treatment. It is best to turn your horse out for a couple of days or just lightly hack if possible. Your equine osteopath will advise you on care of your horse following treatment. Most horses with straightforward issues usually only require 2 treatments to see significant improvement. However some horses have more complex issues and require further treatments. Your equine osteopath will advise how many treatments may be needed at your first appointment. To understand and develop the horse, rider and the relationship. to develop horsemanship and an understanding which is deeper and more sympathetic to the horse rider and relationship. Bradley Whale has been around horses for his whole life, is an ex international rider, has show jumped at national level, dressaged at national level, evented at international level, worked in professional yards but unfortunatly became physically to big to continue at international level. He has broken in horses, completely understands the demands placed upon the horse and rider for top level competition and also how to develop horses from basic work upwards. He understands the difference between the many different types of breeds of horse and how to deal with each type. Teaching this, is to help people in horsemanship NOT standard riding as standard riding is very basic and a process of mechanics. This is to help develop peoples feel and understanding of the equine psycology. Predominatly for people who have lost confidence or are coming back into riding and would like a more insightful relationship with there horse.